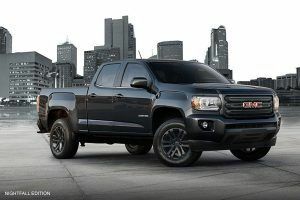 It’s Truck Month at Budds’ Chevrolet Cadillac Buick GMC… And that makes it the perfect time to get that new GMC truck you’ve been drooling over. Choose from several SUV and pickup truck models—in four-wheel or two-wheel drive with several trim levels. The spacious 2017 GMC Acadia is perfect for families who like to take trips or moms and dads who end up playing “taxi” because of a lot of after school activities. It’s safe, too. The Acadia is loaded with nice-to-haves including four-wheel ABS brakes, brake assist, ventilated front disc rotors, stability and traction control, child safety locks, driver and passenger airbags, side airbags, a driver’s knee airbag and curtain head airbags for all three rows. Lighting includes daytime running lights, remote activated exterior entry lights to light up the Acadia at night, front fog lights, and auto-delay, dusk-sensing headlights. Plus, if you’re worried about others “getting in on the action,” the Acadia also features an engine immobilizer and an anti-theft alarm system. The Acadia also features one-touch power windows in the front and power windows in the rear, variable intermittent front wipers, a fixed interval rear wiper and rear window defroster so you won’t have to try to see through a fogged window when you are backing up. Additional features include low fuel level notification, a rearview camera, four-wheel drive with permanent locking hubs and heated door mirrors. In other words, this truck is tricked out. From hauling kids to hauling supplies, the 2017 GMC Canyon SLE provides. And wow, does it ever look great, with aluminum dash and door trim, and aluminum on the center console. Looking around the truck you’ll find covered storage, front reading lights, two 12-volt DC power outlets, steering wheel-mounted audio and cruise controls, front and rear cup holders, a mini overhead console with storage—and plenty of places to put things in the door pockets, seat backs and under the seat. More perks: speed-proportional electric power steering, a power height-adjustable driver’s seat with four power adjustments and six manual adjustments, remote power door mirrors, an electrochromatic rearview mirror and dual illuminated vanity mirrors. Finally, check out the Canyon for great entertainment features like a mobile hot spot, OnStar Guidance, Bluetooth, and an 8-inch front video monitor. When you need a full-size truck but want some luxury, pick the 2017 GMC Sierra 1500. This four-door model doesn’t just look pretty – it’s a workhorse, too. How about a 4.3-liter V-6 engine backed by a six-speed automatic transmission with a hill holder function? The engine runs on regular unleaded gas or E85 and features cylinder deactivation to help you get the best mileage possible. This V-6 engine makes 355 horsepower at 5,600 rpm and 383 pound-feet of torque at 4,100 rpm. 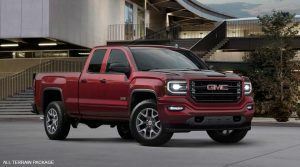 The overhead valves and variable valve timing also help the GMC Sierra to get 13.4 litres/100 km in the city and 10 litres/100 km on the highway. If weight is your thing, you’ll be able to haul a payload of up about 850kg and tow around 2,900kg—that’s a generous three tons. Finally, when you need a lot of space because you enjoy taking road trips with the family, the 2017 GMC Yukon SLT is the SUV that fits the bill. This model features an IntelliLink audio system with a memory card sot, digital audio input, an in-dash CD player, MP3 player, SiriusXM Satellite Radio, nine speakers and speed-sensitive volume control. And it’s a joy to drive on long rides, make no mistake. The Yukon also boasts a mobile hotspot, integrated satellite communications, wireless phone connectivity and an 8-inch front video monitor. Additional features include five 12-volt DC power outlets, one AC power outlet, audio and cruise controls mounted on the steering wheel, front and rear cup holders, door pockets, a full covered center console with storage, a multi-function remote, retained accessory power, an overhead mini console with storage and a remote universal transmitter. The seats, mirrors and pedals feature memory for two drivers. The Yukon also features a heated and ventilated power driver’s seat with four-way power adjustable lumbar. Instrumentation to make your trip easier includes a clock, compass, external temperature display, low fuel level warning and transmission temperature. Looking to get into a GMC Truck? Stop by Budds’ Chevrolet Cadillac Buick GMC during our Truck Event and we’d gladly help you pick your own favourite.